Almost everything you read about sheep leads you to believe that they are very easy animals to deal with. Popular wisdom says keeping sheep is easy, and that’s correct, most of the time. Sometimes, however, keeping sheep is easy like, say for example, keeping Velociraptors and Hippopotami is easy. I confess the sheep were really my husband, Adam’s, idea. As the sole lamb-eater among us he wanted the option of home-grown rack-of-lamb on the table (with homemade mint jelly and handcrafted artisan bread, I’m sure). I, myself, have tried to enjoy lamb on more than one occasion, but I am sorry to say I have never developed a taste for it, nor have our children. One of our (many) mantras then was: “If you have the infrastructure in place to raise your own, raise a few more to sell and offset your costs”, which is a very sound idea, in theory, despite being a cumbersome and not-very-catchy mantra. 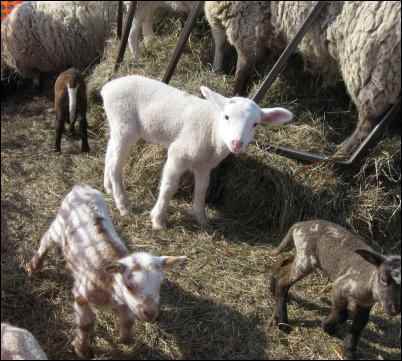 Being the sort of DIY person I am, I took a few classes on carding and spinning, and as I already enjoyed knitting I saw the utilization of their fleeces as a potential new revenue stream for our fledgling farm and warmed to the idea of a fluffy flock grazing our bucolic pastures. First off, there was the question of fencing; we had already divided our pastures and paddocks with several strands of barbed wire for our cattle, but when we realized sheep would have to share at least some of that space, some retrofitting was in order. Many paycheques later (a roll of field fencing being roughly equivalent to a week’s groceries for a family of four), we had a large enough area enclosed in page wire, now only awaiting our woolly bundles of frolicking joy. In choosing sheep, we weren’t as discerning as literature lead us to believe we should be. Our breed options were somewhat limited by what was available in geographic proximity to us and we ended up with a dog’s breakfast of Rideau Arcott, Suffolk, and Katadhin (the latter being hair-sheep and while having the benefit of not requiring shearing, also wouldn’t provide me with any fleeces). 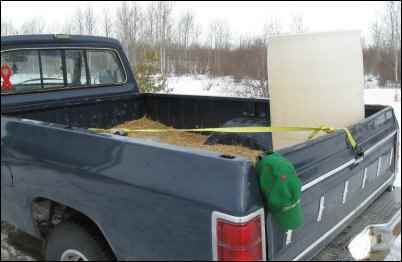 We outfitted our one-ton pickup (which, in private, we referred to as “Fudgie” ; the only vehicle I’ve ever named, I swear, due to it’s plates beginning with FJE) with a homemade “cage” for the bed. If ever a truck was “vintage” and had straw and chaff blowing out from the bed as it drove too slow in front of you on the highway, it was this one. It screamed “Farm Truck” from it’s patina of manure on the wheel wells to the collection of baling twine on the passenger’s side of the sprung bench to the tailgate held on with a come-along attached to the box. The cage we constructed was a clever affair of four panels which slid into the box and were lashed together at the top corners for integrity. It had served us for transporting goats, a few piglets, chickens, you name it. The only thing it lacked was a roof panel; however since from the base of the bed to the top of the side panels was easily five feet, it didn’t give us pause. On my first trip, I picked up eight bottle ewe lambs (bummer lambs being in our budget; a shepherd’s trial, they can’t wait to get rid of them usually). It was during the week and Adam was working in the city at his “Day Job” so I drove the two hours myself, belting bluegrass tunes out over the roar of air from the open windows (our truck, of course, had no air conditioning) and the rattle of various loose body panels. I loved when people would turn their heads to watch as I rumbled past in our blue behemoth and I would think to myself smugly, “Yup, that’s right, I’m a farmer!”. I even wore a green Castrol baseball cap (to shield my eyes, I told myself ostensibly). Fudgie, without the cage, and my trusty green cap. “No,” I answered, trying to seem as if I hadn’t just been thinking the same thing, “Do you think it really matters?” The lambs were only a foot tall, the clearance of the cage five. Here he shrugged in non-committal. I could imagine his train of thought; he wanted this sale to go through and the lambs to leave his property, so in the end he helped me load the last ones in silence and away I went. Almost immediately I realized I should have stopped to go to the washroom while I was still at his farm: I glanced casually in the rear-view mirror and was amazed to see that while the rest of the lambs had their delicate little legs folded under them and were making the best of the ride, one lamb had apparently jumped up and caught her front legs over the top of the cage and was even now scrabbling for purchase with her hind ones. I swore and applied the brakes forcefully. The poor little lamb fell off her hold and rolled back in among her sisters and my heart skipped a beat. I exhaled and picked up the speed again. Now I kept checking the lambs every few seconds and, as I drove on this deserted stretch of sunny highway, I thought to myself how fortunate I hadn’t had someone directly behind me when I had braked for no apparent reason (or maybe they would have seen the little lamb that was about to fall from the heavens onto their windshield). Just then the same lamb (presumably; this batch was all white and, as far as I could see, completely identical) jumped up again. It began to bounce up and down with an obvious intentional effort at getting her front legs hooked over the top again. In defiance of the physics of the situation, her tiny legs carried her dangerously close to the top rail. Again, I brake-checked, this time a little harder, sending the claustrophobic lamb rolling along with the rest of them. They sorted themselves out for space again and the one little maniac kept vying for freedom. Viewed from above (or from behind), my journey must have seemed very erratic with sudden half-stops followed by furious acceleration at various random intervals. I had awful visions of the lamb managing to jump out whilst going highway speeds and this hardened my heart as I kept brake-checking to dislodge her. At this point it was in her best interest to keep her rolling. To make matters worse I felt that my bladder would soon burst, but when I slowed down with the intention of taking a small side road to find some bushes for relief, the little lamb redoubled her efforts at escape and very nearly succeeded. Only by varying my speeds and sending her toppling could I keep her in the cage, while her young kin looked on placidly, shifting easily with the staggered speeds from their prone positions. At last, only twenty minutes from our farm, I couldn’t wait any longer. I pulled into the last gas station before my place and called out to two leather-clad bikers perched on their Hogs. They watched in amazement as I jumped out of my truck before it had hardly stopped and ran into the building yelling, “Please watch my lamb it’s trying to jump out!”, as I passed. I took my time in the washroom, by this point convinced that they had left and the lamb had escaped anyway. After the stop-and-start drive for the last two hours with a necessary pit stop all but impossible, I found I hardly cared. When I emerged into the strong sunlight both men were standing up against the cage peering in at all the lambs sleeping, smiling at their undiminished appeal. “They’re SO cute!” squealed the one with the ZZ Top beard, in an incongruous baby-talk pitch. I shot him a startled glance, and then did a quick count expecting to be short one, but they were all there. As soon as I had stopped the truck the one hell bent on escape had apparently fallen asleep, and the two bikers looked at me as if I were crazy. When I went on another long drive, this time to a different farm, to pick up our new ram, I had a top for the cage. I had learned my lesson. 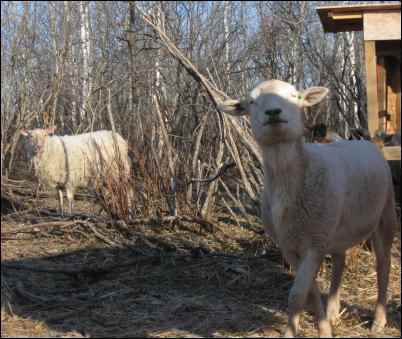 We named him “Waits” after the singer, Tom Waits, because he had the deepest, most gravely “baa” we had ever heard. He sounded like something out of a nightmare; the monster under the bed. At first Waits was personable enough, but he soon grew very belligerent. We rightly surmised that if our bull were as mean-tempered as the ram, we’d all be dead in no time. Generally if you had your eyes on Waits he didn’t try anything, but if you took your eyes off him for a second he’d back up quickly and slam into you with the full force of his thick skull and tiny brain. We took to entering the sheep’s paddock armed with some intimidating item or other, so that when he began to back up we’d brandish said item (usually a stick, but sometimes a shovel) and he would (usually) stop short of contact. I always wondered at his motives for aggression. With my husband or sons I could see it, it had to be the testosterone he smelled that piqued him, but what was his complaint with me? Did he think me an uppity ewe that didn’t follow his lead and had the audacity to leave? Luckily, he was a Katadhin, which was a hair breed of sheep. His greasy fur fell out in lanolin clumps in the Spring and he required no shearing. This was fortunate because not only was he difficult to be around, but he also smelled very strongly of goat cheese at this time. Other than tying him to a tree and watching as he stamped his cloven feet in impotent rage as we gathered up his wives, we didn’t have to do a thing with him come shearing time. Shearing is one of those tasks that once you see it done you think to yourself, “It can’t be that hard”. Not to take away anything from skilled professional shearers—there is definitely an art to it, moreover making it go quickly, painlessly, and successfully—but for the few ewes we had, I figured I could handle it myself that first year. Armed with a pair of grass shears (nope, I’m not kidding, I had a set of grass shears that looked exactly like manual wool-shearing snick-snick shears) I attempted the first ewe. Proving that they may be slightly smarter than most people credit them for, she led us on a merry chase before we captured her. After wrestling with her a bit, we managed to get her in place between the two of us. The ewe stared at me from her awkward position, neck pinned gently underneath my husband’s knee as I, all too slowly, snicked the shears through the thick, greasy fleece on her belly. Her eyes rolled and I knew she was wondering what had brought on this aggressive action when, hitherto, I had been quite trustworthy, bringing only food or affectionate chin scratches. The rest of the sheep huddled in the far corner of the pen watching us suspiciously. There is camaraderie in a flock, but not enough to risk one’s own neck, and so they watched from a safe distance as their friend lay helplessly, muttering softly amongst themselves in the ovine way. The ewe, “Cocoa”, was a Suffolk-Rideau with a brownish fleece the depth of my fingers and golden eyes housing the eerie horizontal pupils of all her kind. Sweat stung my eyes as I struggled to force the blades through the impossibly thick fleece. After about twenty minutes of back-breaking labor, I had to admit defeat as I had only managed to scalp the tiniest part of her lush covering. We released her and she bolted upright and ran a short distance. She “baaed” plaintively turning to look at her partly shorn self (perhaps wondering why she felt several pounds lighter on only one side) as the other sheep bleated in consternation, taking in her partially naked torso. As she trotted over to join the flock, they moved, en masse, away from her. 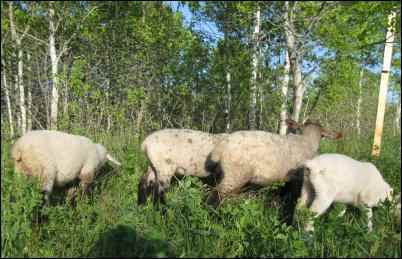 To make a long story short, the professionals were called in and, with electric clippers in hand, my small flock was shorn and bleating at their sudden nakedness in about forty-five minutes. To the shearer’s credit, he didn’t even say anything about the butchered fleece on the girl unfortunate to have been subjected to my inept shears (or more truthfully, the inept shearer). Despite a distinct lack of appealing personality, Waits did his intended job very well and that first season everyone lambed successfully; mostly singles (to be expected with first-timers) and a few twins. However, to us it seemed that in motherhood is a sheep’s natural dim-wittedness most apparent. As first-time mothers, several didn’t know what was happening to them. When they deposited the first lamb, slick and steaming, into the straw, they sniffed suspiciously at it and a couple of them tried to run away. We decided part of the problem was that none of these ewes had been mothered themselves, having all been bottle babies. Given that bit of knowledge, it was amazing that any of them knew what to do. Yet, as anyone who tends livestock can attest, the miracle of instinct is present in most. Without knowledge or guidance the majority of the ewes got up immediately to lick their newborns making the soft muttering “maa” distinctive of ovine motherhood. The instinct in the lamb was just as miraculous to watch. 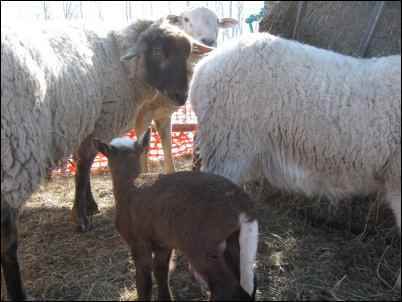 The tiny, wobbling, creature would stand on spindly legs and almost blindly find it’s way to the ewe’s teats. No matter how many times we were fortunate enough to be present for this miracle, it never became any less miraculous.